Note: The profile feature "Data Capture Manager" will not be persisted. User can remove a specific persisted XML through wizard or API query. This feature allows user to use EMDK V 2.1 API to query Persist Manager in order to receive a list of all persisted XML's. 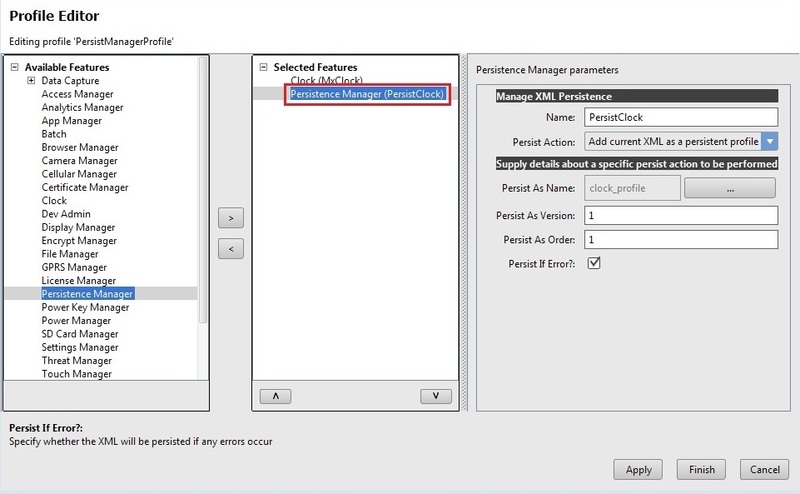 This feature re-sends the persisted XML's to the Mx Framework after an Enterprise Reset. 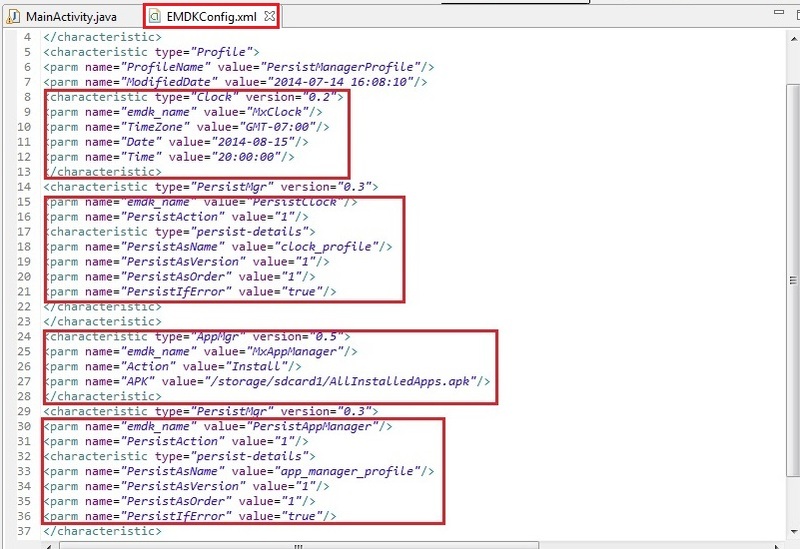 This helps in re-applying configuration settings back to the device for which user had Persisted these XML's. Note: In order for associated files to survive an "Enterprise Reset" they must be placed in the Enterprise Folder on the device. A "Factory Reset" will not persist any profiles features. 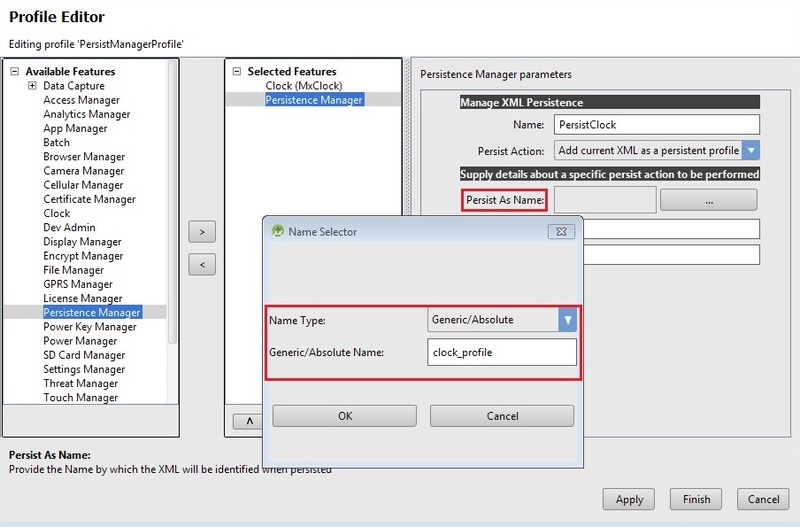 We would store a Clock and App Manager's install configuration settings and create Persist Manager to store XML for each setting. 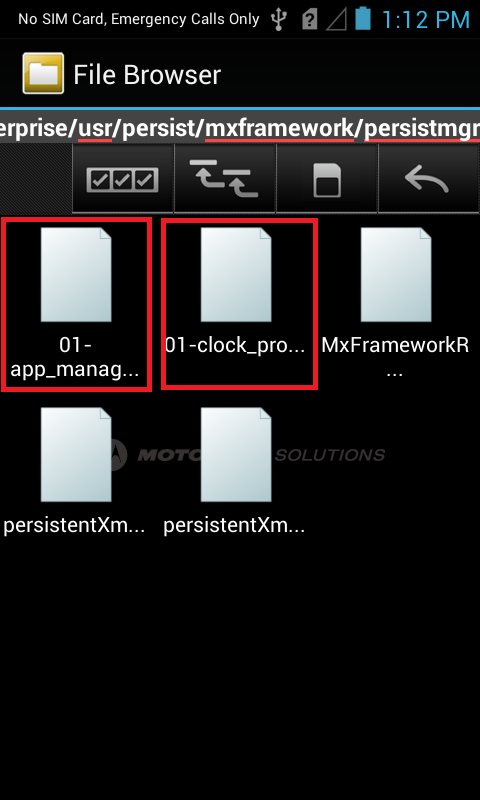 It means we would change the Clock timing using Mx Clock and install any application using App Manager install feature, which will be stored by Persist Manager. We would then deliberately change the Clock timings and uninstall the application that we had installed. Finally we will ensure how the persisted Clock and App Manager settings are re-applied automatically. It means you would see the Clock is reset to the time you had set and the application installed back to the device from the path provided. Download the respective Enterprise Reset package (zip file) according to your device OS version from here and copy that file in SD card/Internal memory of the device. 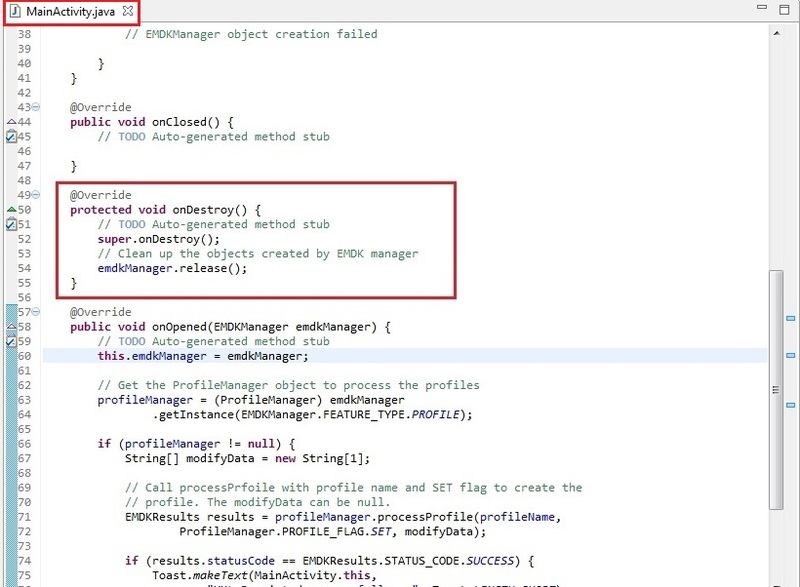 Note: Provide "MxPersistManagerTutorial" as the project name for this tutorial. 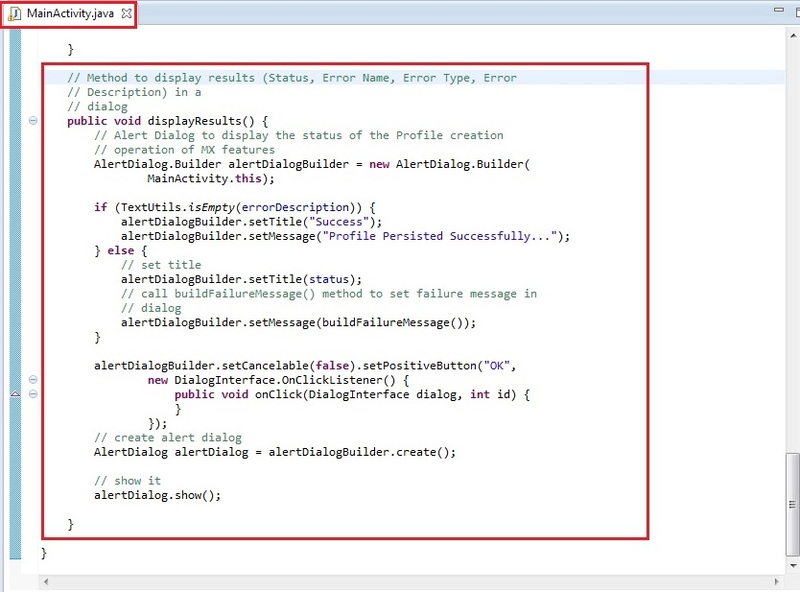 Provide "PersistManagerProfile" as the Profile Name for this tutorial. Now, you can see all these MX features on the left hand side of the Profile Editor window. 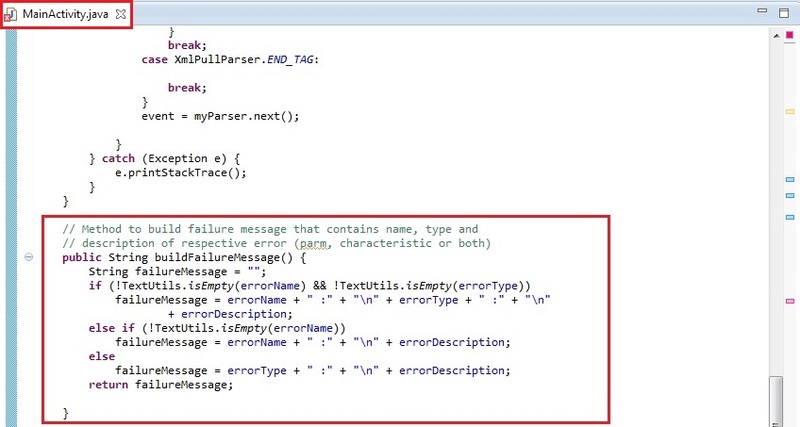 We will persist two XML's for two Mx features in this tutorial. The first feature is Clock. So select the "Clock" feature from the list and click "Right Arrow". 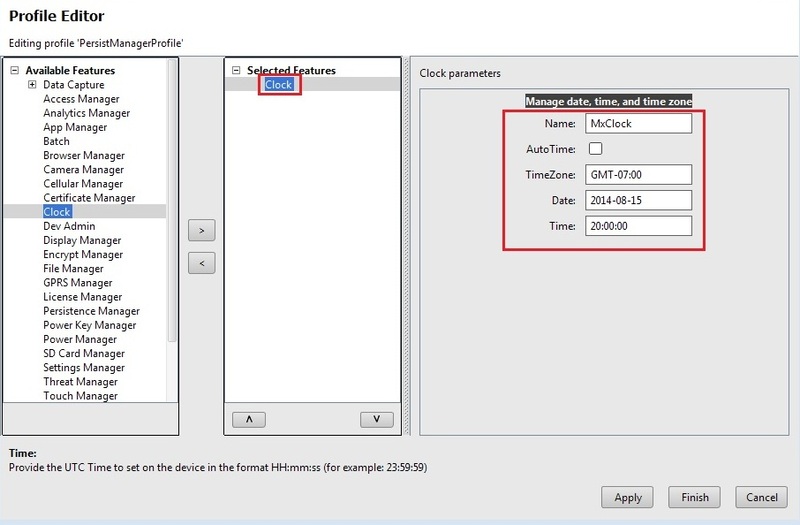 Set the Clock details by providing Timezone, Date and Time values. All the timings need to be in UTC. It means if you want to set the Timezone to PST, you will need to set the clock to GMT time and it will automatically change it to the local time for you. Note: It means the time you enter always has to be in GMT. Here , we have set the Timezone as GMT-07:00. It means if we want to set the PST time of 1PM, we have to set the GMT time as 8PM (20:00:00 in 24 hour format) and it will automatically set the PST time of 1PM for us. Click Apply and your Clock profile is created. So now we will persist the Clock settings by creating a Persist Manager for Clock. 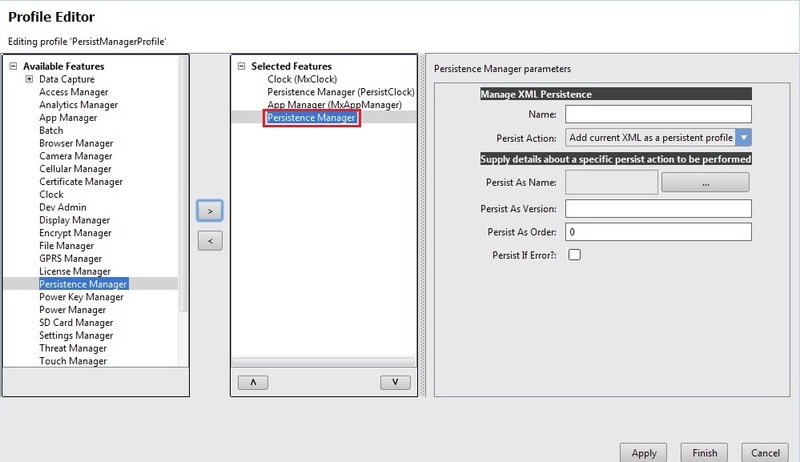 To proceed with this, select "Persistence Manager" feature from the list and click "Right Arrow". Provide some name in the Name field (Ex. PersistClock). 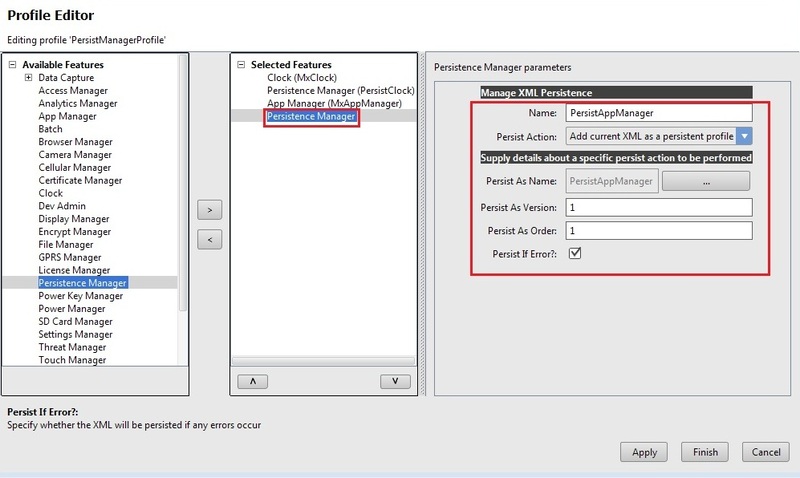 Select Persist Action as "Add current XML as a persistent profile". Select Persist as Name field and a Name Selector dialog will appear. If you want to remove any persisted XML, select Persist Action as "Remove the specified persistent profile". Select Name Type as Generic/Absolute from the drop-down option and provide Generic/Absolute Name in the field (Ex. clock_profile). Click OK. Enter 1 for "Persist As Version". Enter 1 for "Persist As Order". Check the "Persist if Error" field. 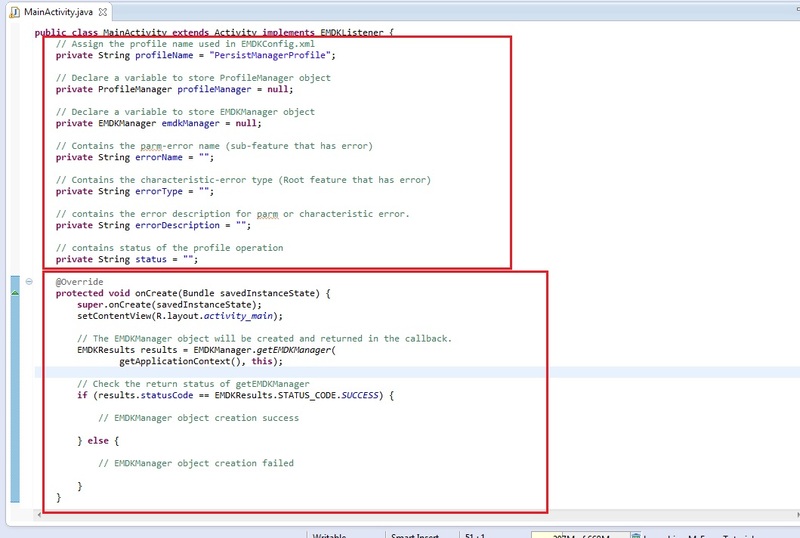 This field will persist the XML even if Profile Creation returns error. Click Apply and the persist settings for the Clock feature will be added. So far we have added the Persist configurations for Clock feature. 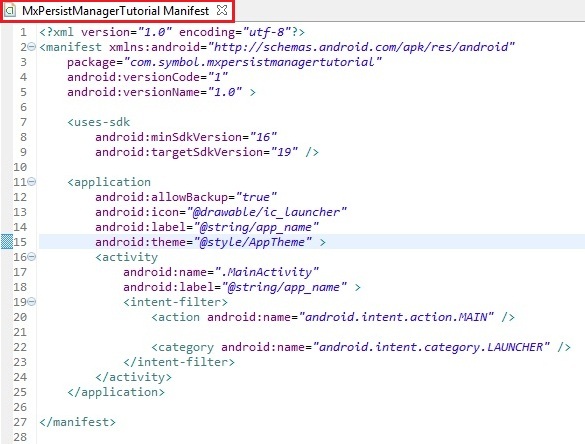 Now its time to persist App Manager feature as discussed earlier. We will follow similar steps as we did for Clock. Select "App Manager" feature and Click "Right Arrow". It will show "App Manager" parameter list. Provide some name in the Name field (Ex. MxAppManager). 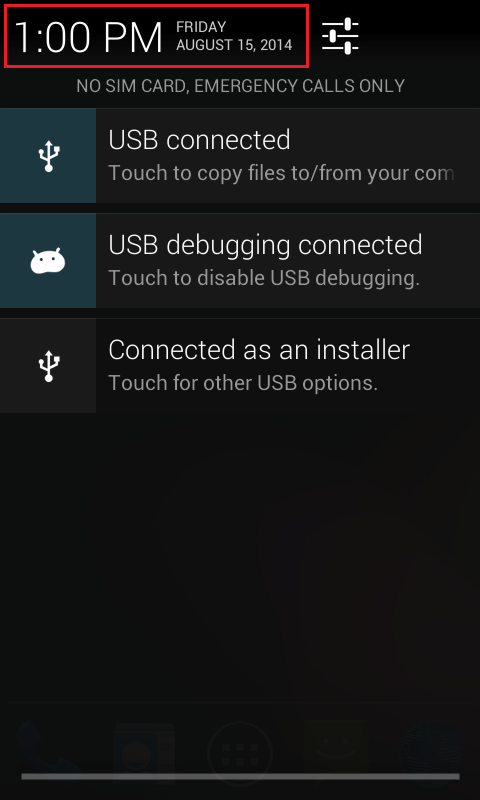 Select Action as "Install" and Provide the APK path to the SD Card of the application that we had downloaded earlier (Ex. 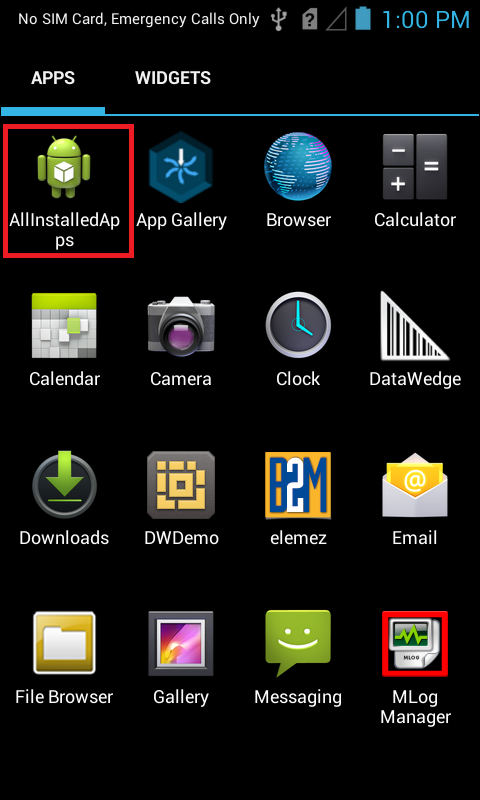 /storage/sdcard1/AllInstalledApps.apk). 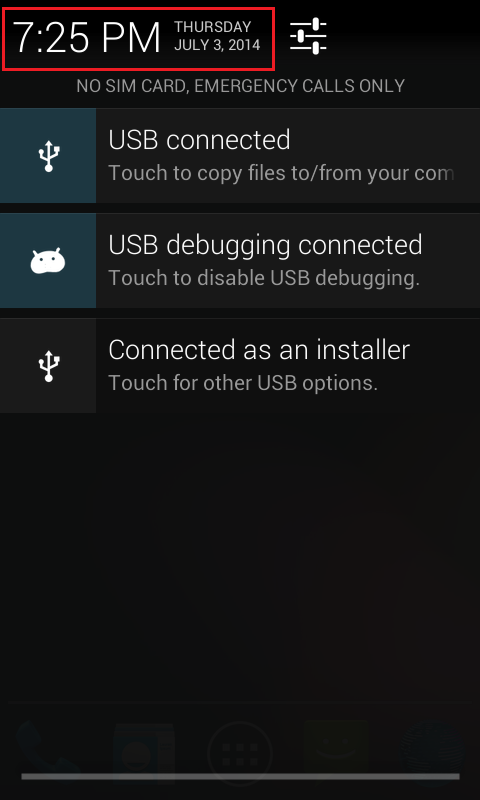 So this feature will install the app in the device from the provided APK file. Note: The SD Card path may be different on different devices. 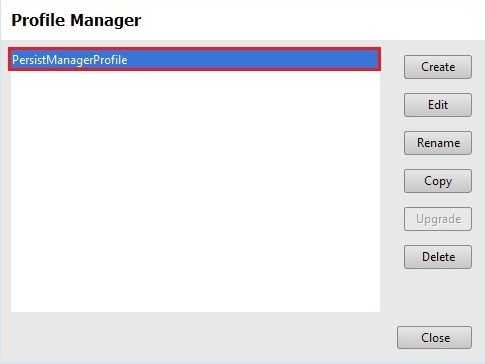 We will add another Persist Manager to persist the App Manager settings. So select "Persistence Manager" from the feature list and click "Right Arrow". Provide some name in the Name field (Ex. PersistAppManager). 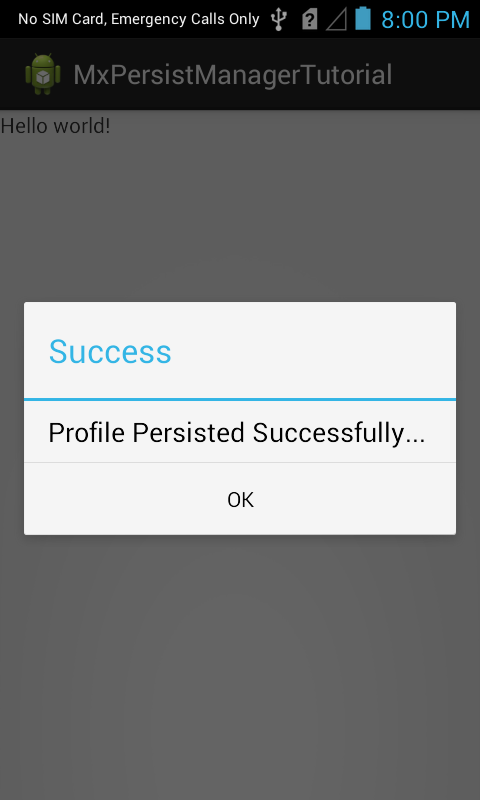 Select Persist Action as "Add current XML as a persistent profile". If you want to remove any persisted XML, select Persist Action as "Remove Persistent the specified persistent profile". Select the "Persist As Name" field and provide Absolute/Generic path as we did earlier for the Clock (Ex. PersistAppManager). Enter 1 for "Persist As Version". Enter 1 for "Persist As Order". Check the "Persist if Error" field. 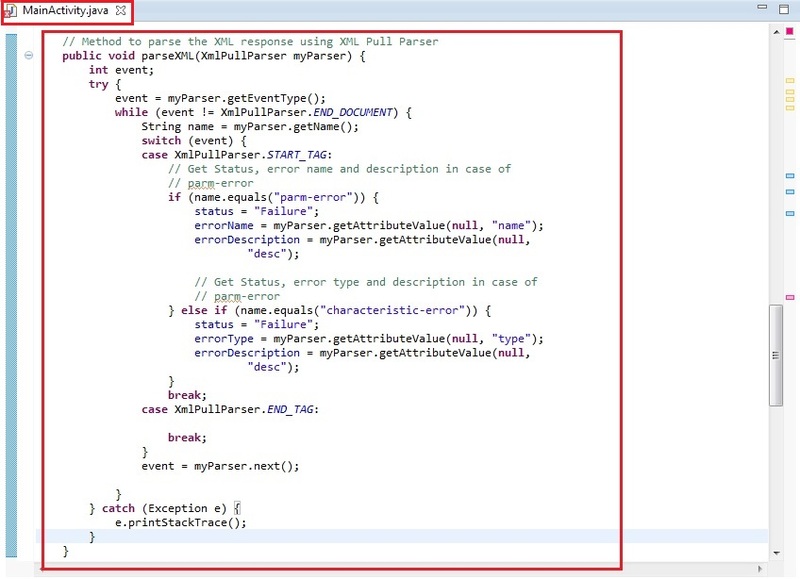 This field will persist the XML even if Profile Creation returns error. Click "Close". 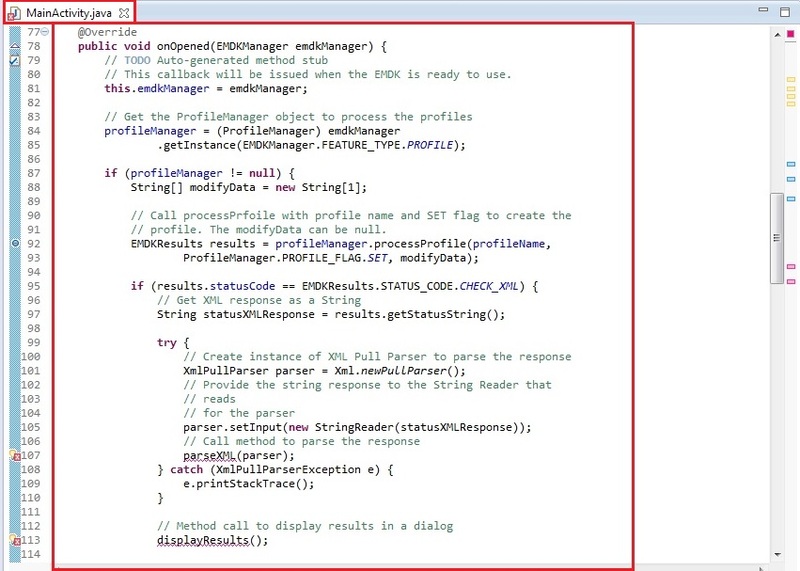 This will create our Persist Manager Profile that is ready to Persist details for Clock and App manager features of Mx. You can inspect the "EMDKConfig.xml" to see it is reflecting the changes made to the parameters via EMDK Profile Manager GUI earlier. However, it is advised that this file not be manually updated and only be controlled via the Profile Manager. This processProfile method returns the result of applying a particular profile that we set using EMDK Profile Wizard in EMDKResults reference. If the profile is successfully processed, it returns the status as CHECK_XML and then we go on and parse the response to get further details whether the profile was applied successfully or not. Otherwise we display a Failure message in a dialog. That's it!!! We are done with all the coding and configuration part. Now let us run the application. Run the application. The Clock and and App Manager configurations are applied and persisted in the device. It means you can now see the Clock Date-Time has been changed to the one we had set in the wizard. 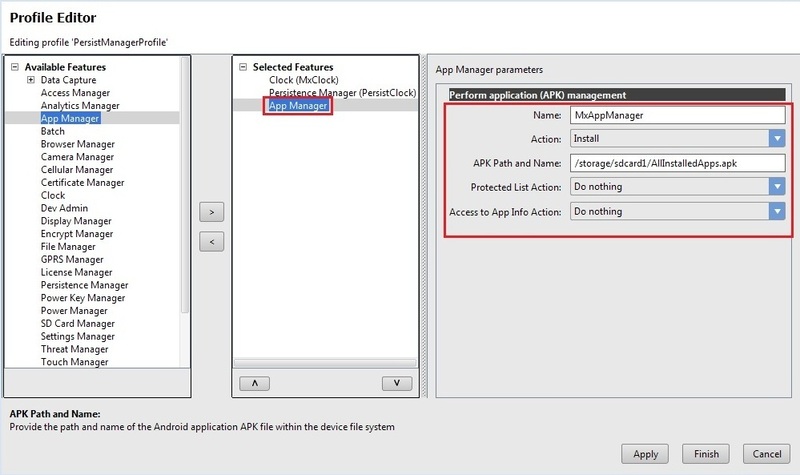 You can also see that EMDK App Manager has installed the application "AllInstalledApps" whose APK path we had provided in the wizard earlier. Now check the Date-Time of the device. You could see that it has changed to the one we set in the wizard during Profile Creation. 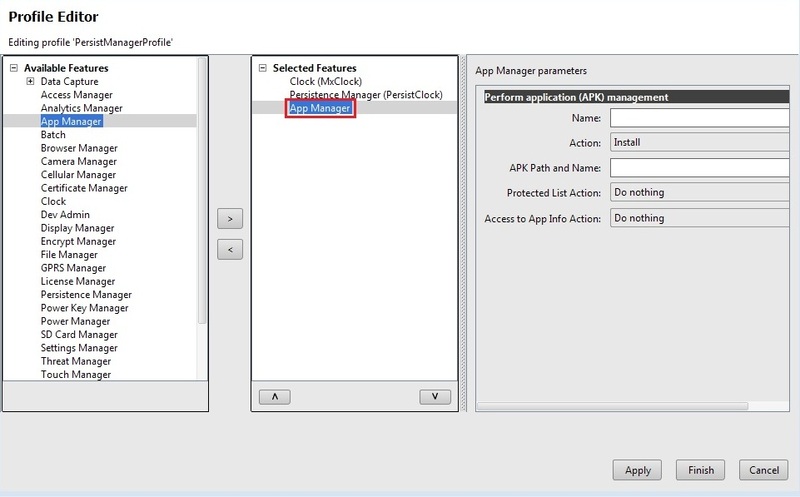 You can also see that APK path of the application we had provided in the wizard during Profile creation has been installed successfully on the device using App Manager's install feature. These configurations were implemented and applied by the respective Mx feature (Clock and App Manager) but the settings are persisted in the XML file by the Persist Manager. 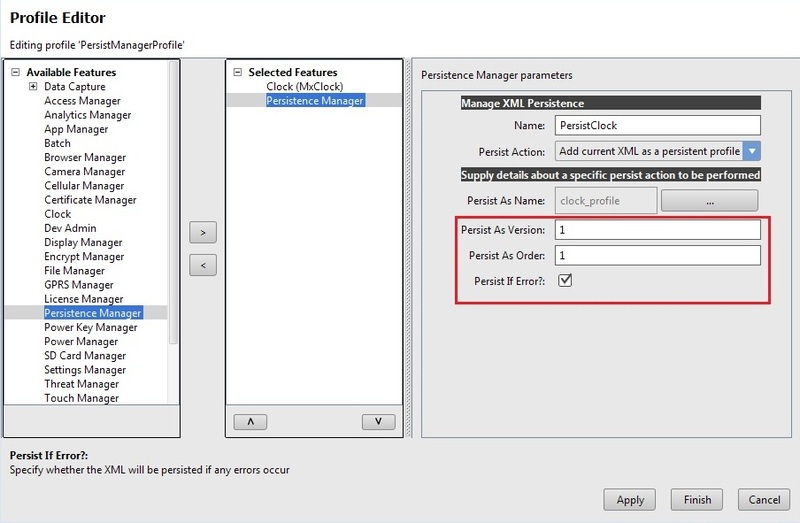 If you open the File browser of TC 55 and go to "/enterprise/usr/persist/mxframework/persistmgr", you will find the two XML's persisted that were created using Persist Manager for Clock and App Manager features of Mx. Now we will see how these Clock and App Manager settings are re-applied automatically after performing Enterprise Reset on the device. Note: Enterprise Reset erases all the user installed applications and resets the Clock to the default time. 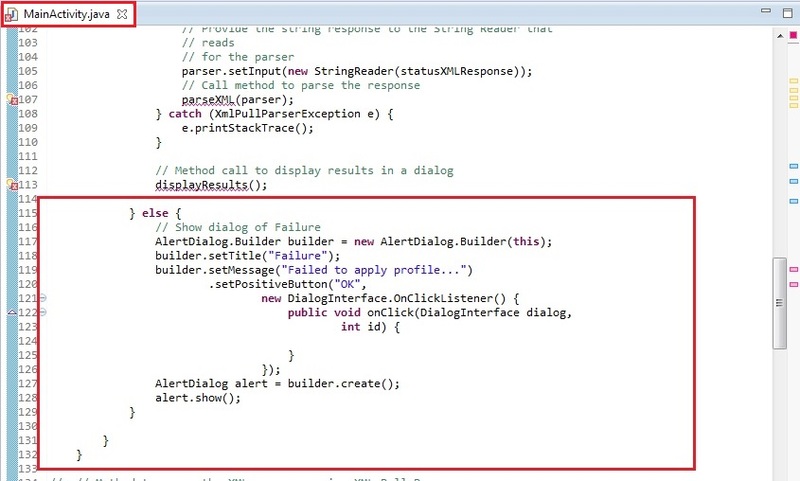 But in our case system will read the details from Persisted XML files and apply changes to the device. Make sure that the Enterprise Reset package (zip file) is present in the device's SD Card. The TC55 shuts down and then reboots. Now select the Enterprise Reset Package (Zip File) stored in the SD Card by navigating to the path. It will complete the Enterprise Reset by erasing data and reboot the device with the default configurations. Once the Enterprise Reset is completed, Persist Manager resends the persisted XML's to the Mx Framework, which is captured by the device. These settings are then re-applied to the device. 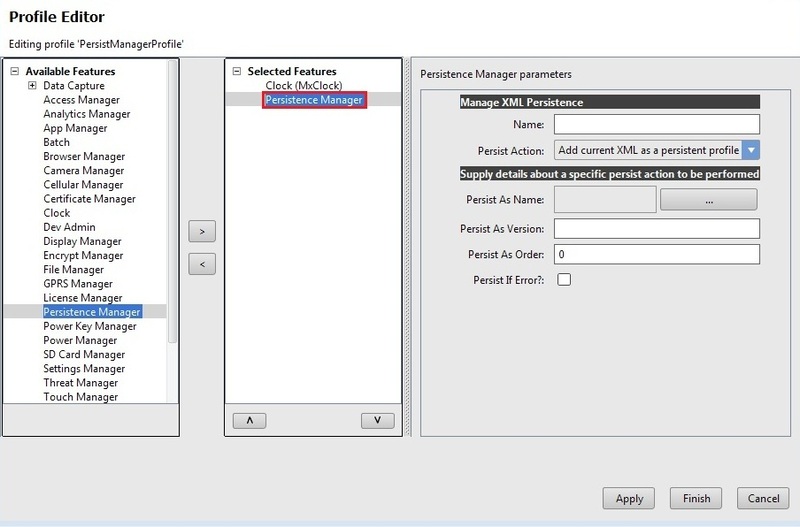 This is how the Persist Manager works in order to Persist and apply the Mx device configuration features. 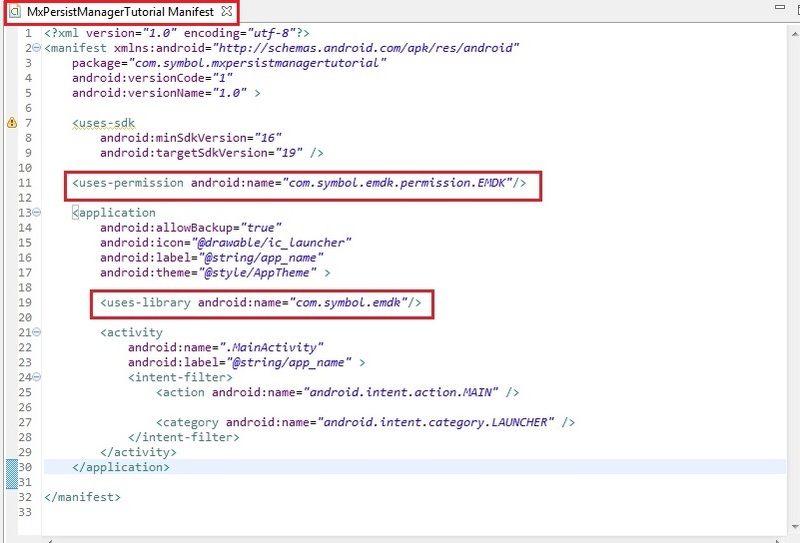 Installing the EMDK for Android application without deploying the EMDK runtime on the Symbol Android device will fail because of missing shared library on the device. 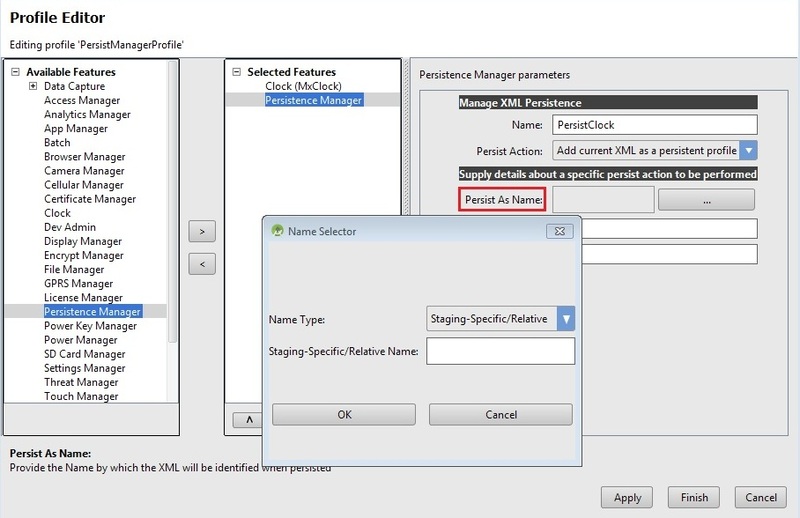 Now that you have learned how to configure and persist device configuration XML's using Persist Manager on your Symbol devices through applications, let us try to understand and implement some of the other Mx features. So in the next tutorial, we will concentrate on the "GPRS Manager" Mx feature and try to explore this feature by creating a tutorial.